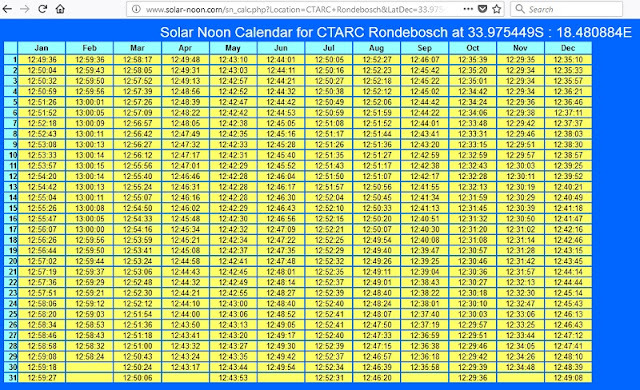 It is an online calculator for Solar Noon at your QTH. Solar Noon is when the sun is at its highest and the shadow cast is at its shortest; the shadow should then be pointing directly North - South. Useful for aligning antennas accurately, if you don't have a GPS. First obtain the Latitude and Longitude coordinates of your antenna's location (which you can acquire from Google Maps - just click on the exact point with your mouse and a label will appear with the selected location's decimal coordinates). Then plug in the Latitude and Longitude coordinates into the fields provided. Remember to set your time zone (as GMT +2 hours for local time). Then the web page prints out a year's table with the exact Solar Noon times for each of the 365 days.